Ram Jethmalani's lonely black money quest prompts him to accuse Modi of "intentional fraud"
Jethmalani said he trusts Kejriwal more than the Modi government on this. In Ram Jethmalani's eyes, the treatment meted out to black money by this government is also the story of its entire tenure. Jethmalani, a renowned advocate and former law minister, believes the turnaround from promising the return of all illegal money stashed abroad to admitting that this was simply an election "jumla" (a deliberate exaggeration) is emblematic of Prime Minister Narendra Modi's tenure. And this reversal, in Jethmalani's words, is serious enough that he felt the need to take out half page advertisements in the Indian Express to air his frustration about this "unpardonable betrayal." The ad summarises the 91-year-old's long battle to bring what he says is an estimated Rs 90 lakh crore, or $1500 billion, of illegally parked funds back to India. It began with following India's approach on the United Nations Convention Against Corruption, signed in 2005 but only ratified by the previous PM in 2011. That was also the year the Supreme Court ordered the appointment of a Special Investigation Team to look into the issue, based on a petition that was filed by Jethmalani and others. Modi took up the issue in a big way in the run-up to elections last year, getting him Jethmalani's support and that of a vast amount of the public in the bargain. But he has now betrayed that support. Addressing his advertisement to Finance Minister Arun Jaitley, Jethmalani ask 12 questions about the way the Modi government has addressed the issue. "Was the statement of the new BJP President, Amit Shah, that the promise of repatriation of black money was a mere election' jumla' made with your concurrence? You have never disowned it and neither has anyone else in the government. This is confession in my opinion of an intentional fraud on the nation." Jethmalani also gets in a few digs against Jaitley, who has never been his most preferred of BJP ministers. Jethmalani, who had earlier levelled serious allegations against former Finance Minister P Chidambaram and the management of NDTV, now accuses Jaitley of having "cordial relations" with them, as if that is a crime. In his questions, he asks Jaitley, an accomplished lawyer himself, how carefully he has read the Supreme Court's judgment of July 4, 2011 in what has come to be called the "Black Money" case. And he asks him to admit that all Jaitley has done since becoming FM has been entering into Amended Double Taxation Treaties, which are prospective, only apply to legitimate businesses and will not help bring black money back. The former law minister has something of a point. The Financial Intelligence Unit detected more than Rs 7,800 crore in illegal monies travelling around the country in 2013-14, an all-time high, quite likely connected to the fact that elections happened around that time. The government has since proposed a black money law with rigorous measures to punish concealment of illegally stashed assets. But the former member of the Central Board of Direct Taxes said that because of technical reasons, this is unlikely to make a major dent in the black money held abroad. Fellow BJP crusader Subramanian Swamy has also agreed with Jethmalani that this law will not bring back the illegal assets held abroad. Jethmalani broke consensus with Modi supporters pretty early on to take up the black money issue, particularly his anger with Chidambaram and NDTV. Earlier this month he put out a statement saying that he felt that the Modi government wasn't serious about bringing back black money or about the BJP task force report on the issue, which recommended stripping citizenship from illegal account holders. He even went to the extent of saying he was putting his hopes on Delhi Chief Minister Arvind Kejriwal to bring back some black money now, not the BJP. With even those comments, also put up on his facebook page, not making much news though, Jethmalani has chosen the advertisement route. He explains himself in the piece. "My battle arises out of a moral compulsion, and I believe it would be a betrayal of the Indian nation if I do not persist with it, even though it has become more and more a lone battle." 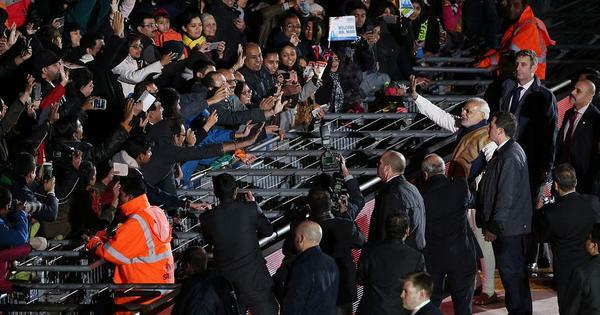 Modi rocked Wembley. Would India allow the Bangladeshi leader to do a similar show in Delhi?